The gods of wind (Fujin) and thunder (Raijin) loom ominously atop a summit of clouds. The wooden statues, each about 3 1/2 feet high, are arranged at either end of the hall's long central platform. 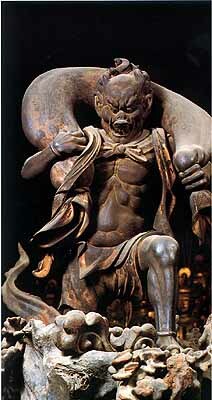 Fujin carries the winds in a bag across his shoulders, much like the Greek Aeolus. 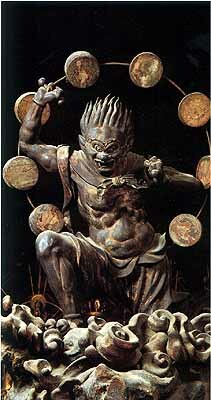 Raijin is surrounded by a circle of drums which he is beating with pestles held in either hand.